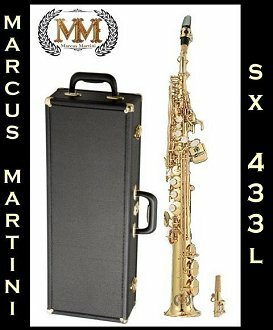 Marcus Martini SX-433L Brass Laquered Soprano Saxophone Description: Specs: Key of Bb, Heavy Duty Brass Body w Lacquer Finish, Leather Pads and Metal Resonators, G# & High F# Key. Accessories: Soprano Saxophone Case, Sax Mouthpiece, Cap and Ligature, Sax Strap, Rico Reed and a Sax Maintenance Kit. The Marcus Martini SX-433L Brass Laquered Soprano Saxophone is a great Soprano Sax for any Student. A great choice for any advancing sax student and can take them well into high school and beyond as it has the more advanced G# feature. Includes a 3 Year Warranty with purchase. We offer several Rent-To-Own options for this Soprano Saxophone. Rent-To-Own for 12, 24 or 36 Months. Monthly payment and program totals will differ according to the plan you choose. We can ship your Soprano Saxophone Rental anywhere in the USA! Order Online Now. Play a Soprano Saxophone Sound Sample.